The warm tones of Italy’s earth! Maimeri’s Italian Natural Earth Oil Colours are created with pigments of antique origin that historically characterized not only the regional schools of painting throughout Italy but also the facades of palaces and monuments in Italian city centres. They encompass the colours of Roman houses, Venetian palaces, and Umbrian and Tuscan hill towns. Only a few decades ago, Italy was the main producer of earth pigments for use by industry and artisans. Today’s colour vocabulary still contains widely known colour names that include Sienna Yellow, Umber, Venetian Red, Pozzuoli Red, Herculanum, Rome Black, and Green Earth from Verona. These are the considerations that led Maimeri to add a new range of Italian Natural Earths to its Classico Extrafine Oil Colour series. 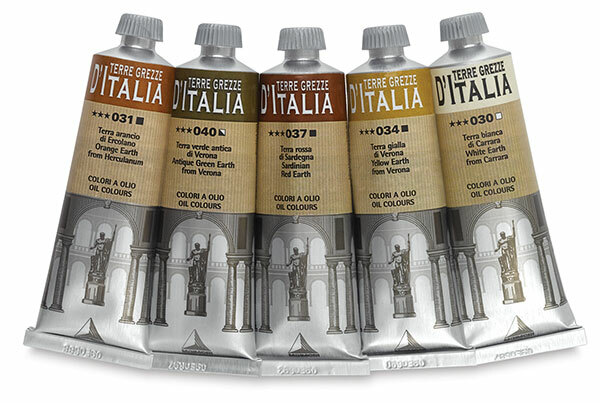 Even throughout the production process, the 11 natural shades in the Italian Natural Earths line retain their ancient formulation. The grain size of the dispersed pigment is larger, the paste is denser, the appearance is more opaque due to a different light refraction, the tone is more natural, and the applied paint coat is thicker than traditional oil paints.